This riverside trail meanders down to a picnic site on the banks of the River Eden. The trail is wide and is suitable for pushchairs. It includes an animal puzzle trail for younger visitors. Return along the same path or take the slightly steeper pushchair friendly route alongside the river back to the visitor centre. 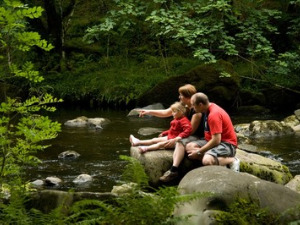 Highlights: The Afon Eden rushing over the rocks at the picnic site on this walk is suitable for all. Take this gentle route suitable for all from the visitor centre down through scent-filled woodlands to the riverside picnic site. See the Afon Eden rushing over the rocks. The first section is two-way and suitable for wheelchair users. The trail then follows the river, climbing back to the forest road to the visitor centre on easy gradients through the area of young oak, rowan, birch and beech. The riverside loop has resting benches at least every 150m and no steps or stiles.